All beading/wire class instruction is FREE with the purchase of materials. If you have all of your materials from home then classes are $15/person. You will need to pick out your materials upon registration so be sure to leave time. Once registered you will receive 20% off that day and the day of the class. Sweet! To register please visit us at the shop! Have questions? Give us a call at 406-543-0018. Registration is required 48 hours in advance. Please call or come by to register, 406-543-0018. Please note we require a credit card on file to register for classes when registering over the phone. Your card will not be charged unless you are a “no show” then you will be charged a $15 non-refundable fee. All cancellations must be made 24 hours in advance. Thank you. In this two part class students will have the opportunity to design, saw, and solder their ring shank, build their bezel frame during the class, and then they will have the opportunity to set and polish their stone. This class has three spaces available. Students must register 1.5wks prior to start date to make certain all supplies are available. Call 406-543-0018 to register or swing on into the shop. Once you are registered and you have paid you will receive a 20% off discount that is good for thirty days on all regular priced merchandise. Students should wear comfortable clothing and bring any snacks they may need during each 6 hour session. There is a supply kit students need to purchase and they start at $79 depending on students own supplies they may want to bring. Please call 406-543-0018 to register or come by the shop to sign up. Payment is required upon registration. No refunds 48 hours prior to class. Students will receive 20% off on regular priced merchandise for thirty days once they are registered for the class. Only 3 spaces available so don't hesitate to sign up today! In this class students will use sterling silver to produce 3 bangles. They will size, shape, solder, texture and wear out the door! This class is only 3 hours and the best way to learn about silversmithing! Call 406-543-0018 to sign up or swing on into the shop. Once you are registered and you have paid you will receive a 20% off discount that is good for thirty days on all regular priced merchandise. Walk in a beginner--walk out with a beautiful and strong single strand necklace. Learn simple techniques for flexwire, crimp beads, and the clasp of your choice. Come early to select your beads! Join us for this excellent beading workshop. Students will learn the bead weaving technique of Peyote Stitch. They will create a pattern that weaves around a beautiful Swarovski or Matubo Rivoli to create a woven bezel. When finished the stitch will create the perfect pair of earrings. Students will have time to complete one earring in this class and have plenty of supplies to finish the second one at home. Instruction is free however there is a Bead Kit required for this workshop and that is $25. It includes all the supplies listed below. Registration is required. Please call us at 406-543-0018 or come by the shop to register. Once registered students will receive a 20% discount that is good on all regular priced merchandise for thirty days! Set an intention that is most meaningful to you and put that prayer in your necklace. We’ll help you choose the semi-precious gemstones and essential oils that will most support your intention(s). Once your piece is done you can wear it as needed or place in a sacred space where you can meditate and find peace. Essential oils are included. All other supplies will receive 20% off. In this class students will make a 7-stranded multi-patterned beaded necklace. We will use 9 different colors of Czech glass seed beads size 11/0. Using graph paper, students will design and draw out their pattern. Once their pattern is illustrated they will begin to string their piece. During this 4-hour class students will start their project and have all they need to finish it at home. Students will leave with clearly written instructions from start to finish so they can replicate the pattern using any type of bead. *Students should wear comfortable clothing, bring snacks if needed, reading glasses, and if they have markers or colored pencils they prefer. We will have some colored pencils and markers for use as well. Learn how to wrap beads, using a needle and thread, between two pieces of leather cord to create an elegant, everyday bracelet. Learn the technique of herringbone weaving with gauged wire and beads to create a fabulous pair of earrings. P-I-S-C-E-S or L-I-B-R-A whatever your sign don’t ya want to tell the world! This quick stamping class will be done so fast you’ll want to make your BFF one too! Join us for this exciting new class! Using size 8/0 Czech Glass Seed Beads you will learn the pattern for making a daisy chain bracelet. Typically you would use size 11/0 beads, but for the first round we use 8/0 so you can see how the pattern is made. Remember all beading classes are FREE for the rest of the year when you purchase your supplies at Bathing Beauties Beads. AND you receive 20% off all regular priced items the day of class. Sweet! Join our guest instructor to learn techniques for manipulating gauged wire into shaped hoop earrings. Students will use a chasing hammer and a rawhide mallet with a bench block and mandrel to shape and texture each pair. Students will make 2 pairs of hoops in this class. Learn how to hammer wire, punch holes in metal and wire wrap to chain. Mix or match your metals to make a sleek n stylish necklace that goes with any outfit! Join us for our 4th Annual Jeanne Auen Memorial Fundraiser! 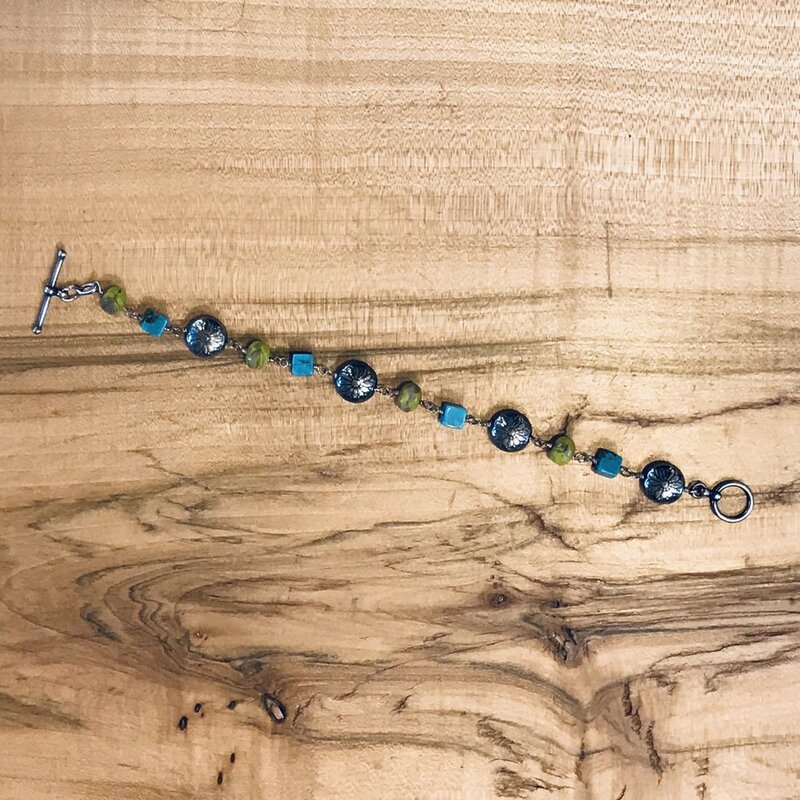 This year artists from all over Montana designed jewelry from packets of beads donated by the family of Jeanne Auen, Tana Burke, Julie , Bonnie Tarses, Carol Tanenbaum, and Bathing Beauties Beads. 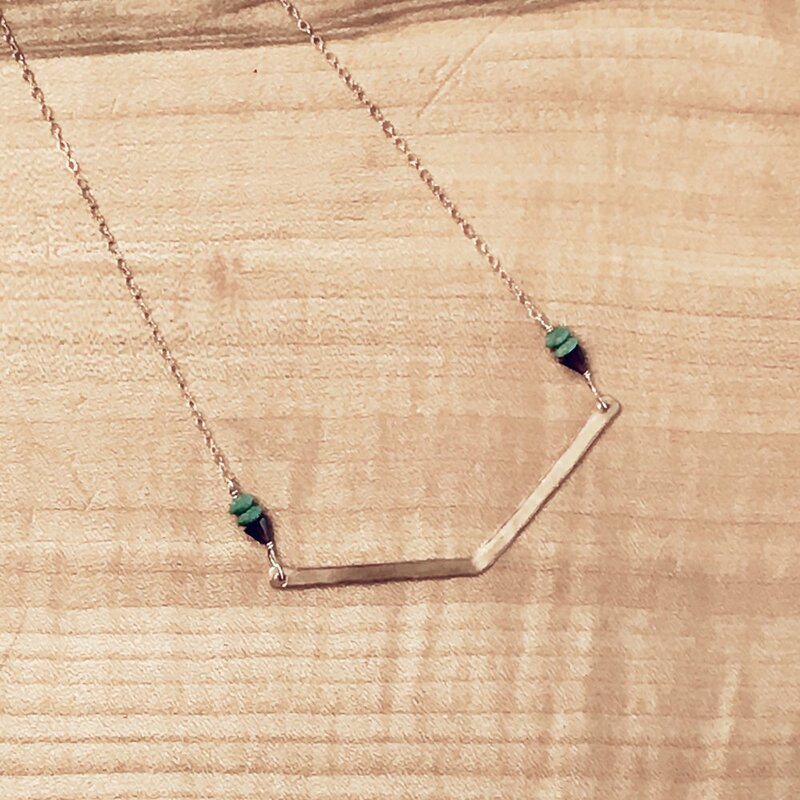 100% of the sales from the jewelry sold will go to the Missoula Food Bank & Community Center! This is an event you won't want to miss. Market on Front is catering the event so be sure to get here early to pick out your goods and enjoy some yummy treats! For more information please call us at 406-543-0018 or swing on into the shop. This class has three spaces available. Cost is $325 per person and includes all supplies and a 20% discount good for thirty days. Bend, hammer, & wrap wire into a pendant of your favorite state: MONTANA! Include a sapphire to mark a special city or landmark! Finish as a chain or cord necklace. 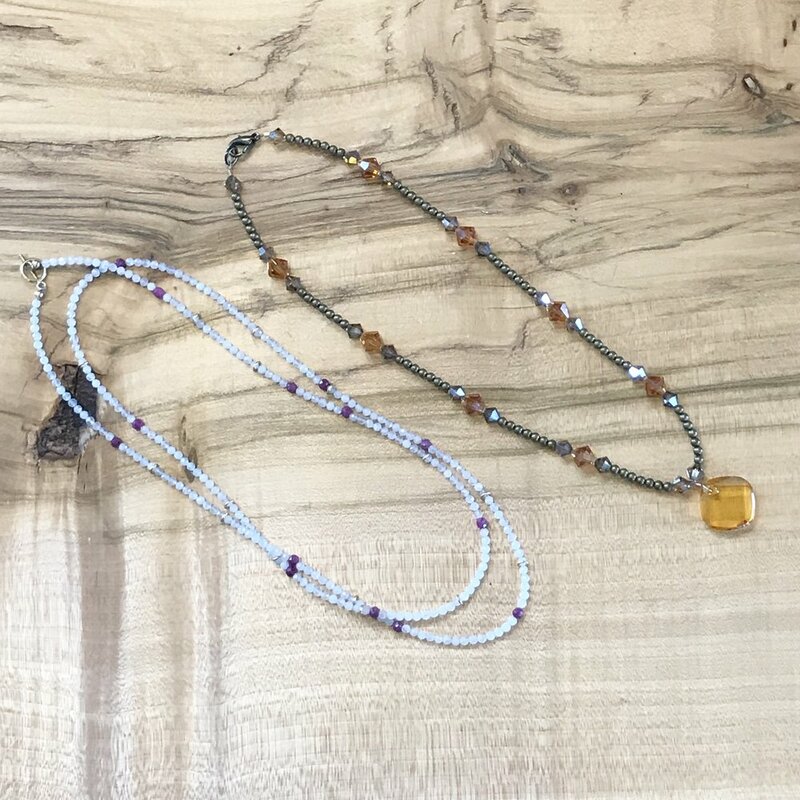 Create a multi-strand necklace with eyepins, cones, and large holed crimp beads for a chunky look, or use spacer bars for a graduated multi-strand necklace. Sometimes in life we all need a little talisman or piece of jewelry that reminds us to breath and become grounded or that offers us strength. We will use semi-precious stone beads, essential oils, and rudruksha beads to create the perfect recipe. You can wear, hold, or display your creation on your meditation altar. Friday, October 19th 4pm to 9pm, students will learn to build their ring shank. Using sterling silver students will form their own ring band to be used in the finished piece! Saturday, October 20th 2pm to 7pm, students will build their bezel that will be soldered to their ring shank from the night prior. Sunday, October 21st 12pm to 4pm, students will polish and then set their stones to complete their finished ring! Cost for this workshop is $850/person and all supplies are included! AND Dinner will be provided on Friday and Saturday evening. To register or for questions please call 406-543-0018. Payment is due at time of registration. Learn to accentuate stones with the simplicity and elegance of fine chain. Create a necklace and pair of earrings, or several pairs of earrings. Practice the skills that enable you to gracefully connect stones and chain using wire. Please join us for First Friday featuring works by Master Goldsmith Carla Bissinger. This is a one-night-only event that you won’t want to miss. I am a Goldsmith from Berlin/Germany, now living in Missoula/Montana. I love colors and finding interesting combinations. Shapes also fascinate me, especially organic figures shaped by the patient work of water or wind -pebbles; trees; driftwood-, or the beautiful shapes of plants and sealife. That's why I mostly find my inspiration in nature. But also modern architecture, found objects such as rusty machine parts, or interesting silhouettes or shadows of structures are inspiring to me. Everything that was allowed to grow organically has a deep beauty to it. Also my jewelry was developed in a process that took time. My themes are the rhythms of the natural world and the beauty and comfort within it. It makes me happy to make jewelry and to make the wearer happy. Last Saturday w/ Mermaid Collective Pop-up Show! Join us on Saturday, September 29th for our Mermaid Collective Pop-up with the Bathing Beauties Employees! You’ll be able to purchase their designs (not for sale in the shop typically)! Be sure to swing by and say hello to your favorite Mermaid and buy some jewelry! This class will challenge you to break the traditional wire-working mold. You will combine different gauges of wire, small 2mm to 3mm beads to create a lightweight but visually complex pair of earrings. The stuff dreams are made of right here! This bracelet takes the use of wire (yes wire) to an entirely new level to create a bracelet. Students will learn how to use square wire, a mandrel, and pliers to make a layered bangle. Another one to show off to your friends and then SELL it to them. Yeah girl! Takin' it back to the teenage years, hanging with your bestie smoking cigarettes and weaving hemp! Learn a simple knotting technique used to make a pair of long Funky Hemp Earrings with African Beads. Bridget Miller is an artist based out of beautiful Missoula, MT. Born and raised in Montana she is inspired by the wilderness, landscapes, and culture of her homeland. Each piece of jewelry she makes reflects the elements of her surroundings focusing on natural elements. She thrives on positive impacts that creativity cultivates both on herself and those that wear her jewelry. Pick out your favorite dangly beads, chain, and a few accent beads to design your best "ladies night out" pair of earrings... EVER! In this class students will learn the fundamentals of using a jewelers saw, files, sandpaper, and a metal punch. Students will cut 2 pieces of metal adding embellishments to complete a beautiful "no clasp" necklace! The perfect intro to metalworking tools! Cost is $45 * and includes a $20 supplies credit to use towards metal, beads, wire, and chain! Give us a call at 406.543.0018 or come on by today! Learn how to bend and hammer wire into circle shapes that will then be linked together with basic wire wraps. In just one hour, you will have a fabulous new pair of earrings! Class is $25 per person not including supplies, all classes come with a 20% discount that is good for one month! Sweet deal! Call us at 406-543-0018 or come by and sign up today!